Welcome to the Student Studyspace for Doing Ethics. 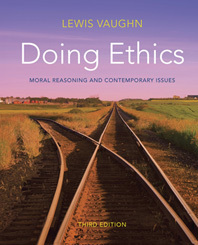 This site is designed to help you improve your understanding of the basic concepts of moral reasoning, argumentation, and moral theories, and how they may be applied to contemporary ethical issues. structure of this site uses contemporary pedagogical techniques to help you strengthen your study habits. The site is organized into three parts: Organize, Learn, and Connect. Flashcards of each chapters' key terms are available for additional practice.